We are currently taking any requests for shows (both public and private) Please e-mail for current pricing and options. Want to learn to spit fire? We are currently working on classes on FireSpitting 101 and training courses. Please e-mail us with any requests you have for this area and we'll see what we can do as we go. 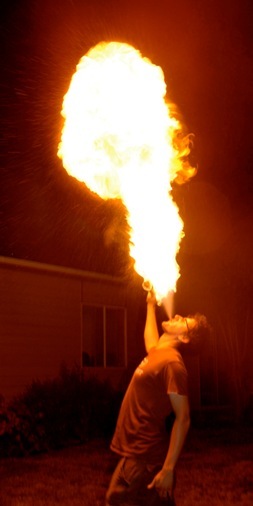 Want a print of you spitting fire? If you have spit fire on this site before, or would like to spit fire and get a print of you doing it, shoot us an e-mail and we'll send current pricing for that as well. 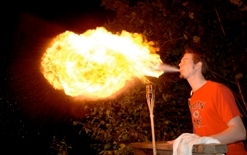 Photographing Firespitting requires a special skill and determination. It is typically found to be an ultimate challenge for photographers. Robert Harder is our firespitting photographer of choice. We have never had someone with as much talent taking pictures. He is available for booking for nearly any kind of event. He does formal and informal 208-596-5953 or email rob.firephotos@gmail.com.